"Negev" in Hebrew means south. Israel's Negev Desert, where Abraham, Isaac and Jacob tended their flocks, comprises 66%, over 13000km² of Israel. The Negev covers the greater amount of Israel's official Southern District. Triangular in shape, with the resort town of Eilat at its southern apex and Beer Sheva as its northern base; the western border is touching with the desert of the Sinai peninsula, and the eastern border is the Wadi Arava. Following a visit to Palestine in 1867, Mark Twain described the Negev Desert in his book "The Innocents Abroad" as "a desolation that not even imagination can grace with the pomp of life and action". -The Northern Negev, with 30cm of rain annually, is called the "Mediterranean Zone", with fairly fertile soils. 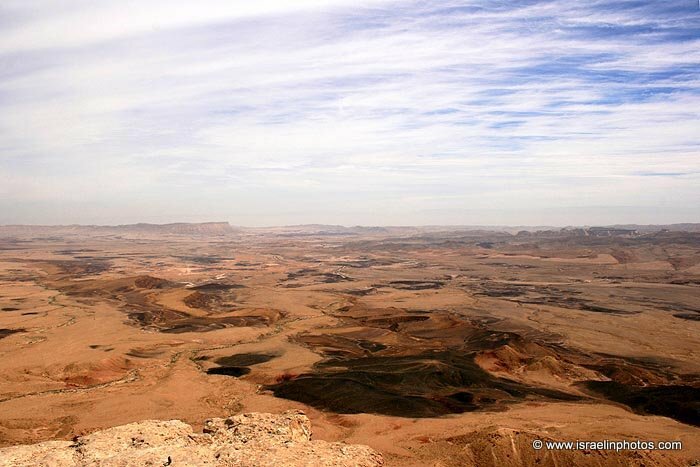 -The Western Negev is characterized by 25cm of rain per year, with light and partially sandy soils. Sand dunes can reach heights of up to 28 feet. -The Central Negev, with the city of Beer Sheva in its midst, has an annual precipitation of 20cm and is characterized by impervious soil, allowing minimum penetration of water with greater soil erosion and water runoff. -The high plateau area of Ramat Hanegev stands 365-550 meter above sea level with extreme temperatures in summer and winter. The area has only 10cm of rain per year, with inferior and partially salty soils. -The Arava Valley along the Jordanian border stretches 180km from Eilat in the south to the tip of the Dead Sea in the north. Defined as very arid with barely 5cm of rain annually, the Arava has inferior soils in which little can grow without irrigation and special soil additives. Because of these poor conditions, the Negev was largely undeveloped and sparsely populated during Israel's first five decades. In spite of this, Israel has succeeded in becoming a world leader in combating the desert and preventing desertification of fertile lands. Through responsible water and soil conservation programs, Israeli techniques have become models in sustainable land management, with worldwide implications. It was Ben Gurion who said: “It is in the Negev that the creativity and pioneer vigor of Israel shall be tested”. He made it is home when he went to live in kibbutz SdeBoker. Today, the hut where he lived is a museum. For centuries, the area has been "home" to Bedouins who have increasingly given up their nomadic lifestyle and settled in permanent homes. The Bedouin tribes in the Negev and the Sinai all trace their origins back to the Arabian Peninsula, somewhere between the 14th and 17th centuries. According to Bedouin traditions and historical evidence, these tribal ancestors came to the Negev for three main reasons. Some, such as the Masa'id, Suwarka, Tyaha and Ugbi, came in search of better pasturelands. Others such as the Tarabin, Muwaytat and Ahaywat came in search of economic gain, conveying and protecting Mecca-bound Muslims pilgrims between the Suez and Aqaba. Many, such as the Ayada, Dhullam and Muzayna tribes came fleeing from blood-revenge, often as a small clan, or even as individuals. Bedouin towns in the Negev include Rahat and Tel Sheva. The Negev has a few interesting cultural and geological attractions. Among these are three machteshim, which are unique in the region. Machtesh is a Hebrew word that does not really have a translation. Machteshim are formed when water seeps into the peek of a large mountain, eroding from the inside, creating a large lake. As the water level increases, the erosion increases, until the top of the mountain collapses inwards, creating a large lake with lots of debris at the bottom. The erosion process continues, until a gap erodes in one of the walls. When this happens, the water flows out leaving something really big that looks a bit like a crater, but with much steeper walls and (depending on the size of the mountain) often much, much, much bigger. Machteshim are spectacularly impressive natural occurrences because of the sheer drop and the sheer size. Three Machteshim are in Israel: HaMachtesh HaGadol (the big machtesh), HaMachtesh HaKatan (the small machtesh) and the largest Machtesh is called Machtesh Ramon, the town built next to it, is called Mitzpe Ramon. The Eastern Negev has two of the area's larger towns. The first is Arad, a development town that serves as a convenient stopover for visitors to the Dead Sea and Masada. The town is also popular because of its clean, dry air, which makes it a haven for people suffering from asthma and allergies. Nearby is Tel Arad, a site of a biblical town that is one of the earliest known urban settlements. Further south, on the way to Eilat is Dimona, a town established in the 1950s to help absorb Jewish immigrants. Originally considered too remote and its climate too unpleasant for large-scale settlement, the town has grown to be a thriving community of more than 20,000. It is best known, perhaps, as the site of Israel's nuclear research program and is believed to be the site where nuclear weapons have been developed. It is also known as the home of the Black Hebrews, a sect that originally came from Chicago and settled in Dimona. Just beyond Dimona is Mamshit, one of the best preserved of the Nabatean towns. It was built in the first century, probably the last of the five cities the Nabateans built along the roads from their capital in Petra to the coast. For many years, before 200 BC, the Nabataeans had slowly emigrated from their homeland in Arabia into the Negev. And so it is that the Nabataeans like the Arabian tribes before and after them, began to slowly move out of the Arabian Desert and into the Sinai and Negev region. Diodorus tells us that as far back as 250 BC, Nabataean villages had sprung up along the shores of the Red Sea, and at important oasis in the desert. These small settlements would eventually grow to become important trade cities, located along the ancient trade routes that crisscrossed the wilderness. As the Nabataeans moved from being a nomadic people to being civilization builders, they applied their skills in water collection, so that they could provide their caravan stations with water. These water systems were expanded as the caravan stations grew in size, and eventually became small cities in their own right. Mamshit was annexed by the Romans in 106 C.E. and the town was renamed it Memphis. The town grew for several centuries until being abandoned after the Muslim conquest in 636. During the Byzantine era, three churches were constructed and the remains of some of the mosaics are still visible as are parts of the Roman city walls. In one room archaeologists found a bronze jar filled with 10.000 silver coins dating from the first and second centuries. Other Nabatean settlements are Avdat and Shivta. The Arava Valley forms part of the border between Israel to the west and Jordan to the east. The oldest kibbutz in the Arava is Kibbutz Yotvata, founded in 1957. Yotvata was named for an ancient town in the Arava that is mentioned once in the Bible. Kibbutz Lotan, which is one of Israel's newest kibbutzim, has a bird-watching center. In ancient times the Arava region was more settled than it is today. In Biblical times the area was a center of copper production; King Solomon apparently had mines here (Timna National Park).